Scroll down to see all the places. 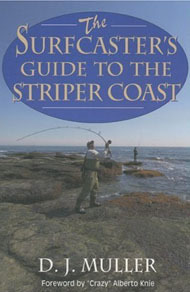 They are arranged from North to South along the striper coast. Martha's Vineyard is home to the famous Martha's Vineyard Striped Bass and Bluefish Derby, which is held in the fall of each year. There striped bass fishermen fish day and night in their quest to catch the largest striped bass, and the prestige and bragging rights that come with it. Follow this link to find out more about: Martha's Vineyard. If you want to catch large striped bass, go to Cape Cod. More 70 pound-plus stripers have been caught on and around Cape Cod than any other place. Cape Cod's beaches are considered the best in the world, and include the Cape Cod National Seashore. 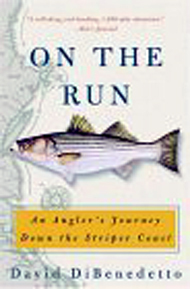 The Cape juts out into the Atlantic Ocean and intercepts striped bass in the spring as they migrate north, and again in the fall as they return south. Follow this link to find out more about: Cape Cod. Migrating Stripers sometimes take a short cut through the Cape Cod Canal. This canal connects Cape Cod Bay with Buzzards Bay in the south. It saves going all the way around the cape. The canal is 17.4 miles long, 540 feet wide, and 32 feet deep. It is the widest canal in the world. No boat fishing is allowed in the canal, but fishing from its shores is allowed and is normally outstanding. There is a paved service path along its shore, as can be seen from the picture. No cars are allowed on the service paths so fishermen use bicycles. Fishing reports from this area often refer to the "ditch". The ditch they are talking about is the Cape Cod Canal. 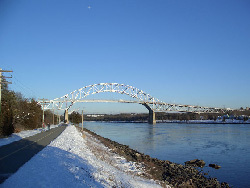 Follow this link to find out more about the: Cape Cod Canal. Block Island is located at the extreme north end of the Long Island Sound where it converges with the Atlantic Ocean. Stripers pass by Block Island on their spring migration. Many decide to stay, and hang around the Island from May to November. Montauk sits on the farthest tip of Long Island, which juts out into the Atlantic Ocean. Southbound stripers during the fall migration brush its shores. At Montauk during October, fishermen line its shores trying to catch stripers. Follow this link to find out more about: Montauk. Follow this link to find out about: Montauk Fishing. 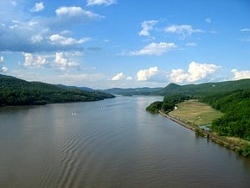 The Hudson river, and it's estuary, is the second most important nursery for the spawning of striped bass, second only to the Chesapeake Bay and it's river systems. It is a great place to catch striped bass, especially in the springtime. Hudson River Striped Bass Fishing. In the Spring adult bunker move into the Raritan Bay with striped bass and bluefish chasing them. They are also often within range of surf fishermen on Sandy Hook. In the fall the striped bass migration goes right past, and sometimes lingers for awhile near Sandy Hook. Island Beach State Park, NJ is a 9.5 mile stretch of barrier Island whose south end coincides with the north jetty of Barnegat Inlet. The island is noted for its excellent surf fishing for both striped bass and bluefish, and its beach buggy access. "Cape May Rips," are one of the most productive locations for catching stripers along the striped bass migration route. The stripers stop by there in both the spring and the fall. Chunking for striped bass is also very popular and productive in the bay. Follow this link to find out more about: Delaware Bay. The Chesapeake Bay is a striped bass nursery. About 75 percent of the striped bass in existence were born in the tributaries of the Chesapeake Bay. 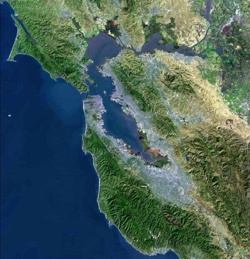 Over 150 freshwater rivers and streams drain into the Bay. 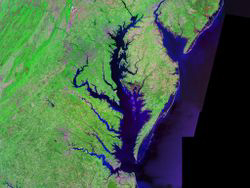 The largest is the Susquehanna River. The Chesapeake Bay is a great place to fish for striped bass. Follow this link to find out more about: Chesapeake Bay. Striped bass are often going into and out of the Chesapeake Bay. A favorite hang out there is the Chesapeake Bay Bridge-Tunnel. Some great striped bass fishing takes place around the Bridge-Tunnel's islands and pilings. 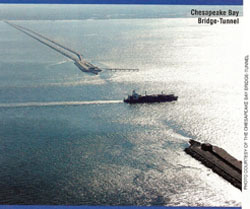 Follow this link to find out more about the: Chesapeake Bay Bridge-Tunnel. In December and January striped bass fishermen turn their attention to the waters down around Virgiia Beach. That is because there are a lot of stripers around there during those months of the year. Follow this link to find out more about: Virginia Beach. Most migrating striped bass spend the winter in the deeper, warmer ocean waters off of the coasts of Virginia and North Carolina. There they are heavily fished by boats originating out of the Oregon Inlet area of North Carolina. The Oregon Inlet Fishing Center is home to the largest and most modern fishing fleet on the Eastern Seaboard. Some stripers go further south, nearer to Cape Hatteras, which is about 50 miles south of Oregon Inlet. 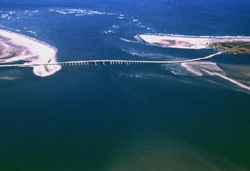 Follow this link to find out more about: Oregon Inlet. Cape Hatteras is a bend in Hatteras Island, one of the long thin barrier islands that make up the Outer Banks. It is where the colder Virginia current moving south meets the warm Gulf Stream moving north. Many migrating species have either their southern or northern terminus near the Cape. Striped Bass were introduced into California' s San Fransisco Bay in 1879. They prospered and spread. Follow this link to find out more about: California Striped Bass Fishing.